Wooster, OH – We hosted a virtual visitor in today’s GeoClub seminar. Dave Ramsay, a geologist from the Cascades Volcano Observatory, connected with us via the web to tell us about the geology of Crater Lake. 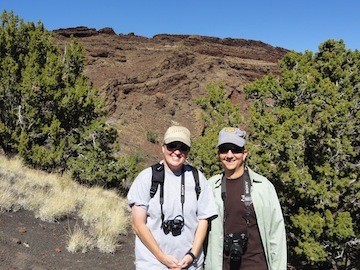 Shelley Judge and Dave Ramsey bumped into eachother at the conference on Volcanism in the American Southwest. Both are alumni of the same undergraduate geology program! Dave and his colleagues have done fantastic work mapping the floor of Crater Lake. Crater Lake formed from the explosive eruption of Mount Mazama about 7700 years ago. On most geologic maps, Crater Lake is a blue body of water. But Dave and his colleagues used multibeam swath echo sounders and a human occupied submersible to map the geology of the lake floor. Map of Crater Lake showing features of interest on the lake floor. Klimasauskas, E., Bacon, C., and Alexander, J., 2002, Mount Mazama and Crater Lake: Growth and Destruction of a Cascade Volcano: U.S. Geological Survey Fact Sheet 092-02. Dave took us on a fly-through tour of the geology and told us stories about how many of the geologic features developed. He and his colleagues found that Wizard Island is much bigger than we may have expected, and that it erupted both under and above water while Merriam Cone erupted exclusively under water. Snapshot of the geology of the floor of Crater Lake. Here, Wizard Island (gray peak) extends below the water (green). (Photo Credit: David Ramsey). Many thanks to Dave for talking to us first thing this morning (west coast time) and for giving such an engaging and entertaining seminar.